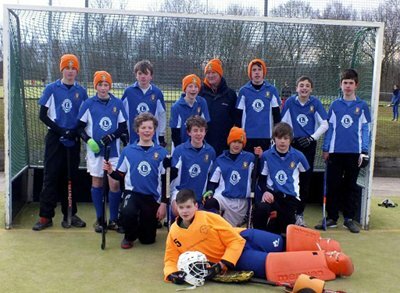 Wotton-under-Edge Hockey Club's outstanding squad of under-14 boys travelled to Holland at Easter to test their skills against teams from arguably the world's top hockey nation. Wotton-under-Edge Hockey Club’s outstanding squad of under-14 boys travelled to Holland at Easter to test their skills against teams from arguably the world’s top hockey nation. Competing in the Loenense Hockey Club’s Oranje Tournament against teams drawn from many of Holland’s top clubs, some with junior membership of over one thousand, Wotton finished third after a twelve-match round robin and just missed a place in the final. By common consent amongst the coaches, Wotton played the most eye-catching possession hockey and it was only the superior clinical finishing of the Dutch sides that squeezed the Blues into the bronze medal position with a playing record of W 5 D 4 L3. The tournament was won by the host club Loenense against whom Wotton had previously won and drawn, but it was the losing finalists Maastricht who had been Wotton’s nemesis, inflicting two narrow defeats in the round robin stage. The twelve-man squad of Wotton players Charlie Thomas, Patrick Carr, Henry Patteson, Callum Niddrie, Ben Eames, Benji Wells, Mike Buist, Dan Jones, Jago Cropper and Matt Jenkins, and guest players Will Hewer and Jonny Broadhurst, more than matched their opponents for skill and above all team spirit. As a result they and Wotton-under-Edge HC won many admirers from the hospitable and knowledgeable spectators. The Club would like to thank the sponsors who supported participation in the tournament: Wotton Directory, Tyndale Farm Veterinary Practice, Rowe Vet Group, Heart Vets and Bubble Driving School – and the Lions who previously sponsored the under-14 strip. Participation in the tournament was organised impeccably by Badgers’ Manager Mark Patteson who, along with Coach Alan Hooper, was delighted with the response of the team to such an opportunity.